Contributions to the Conference will belong to one of the four sections : 1) Static works (paintings, sculpture, architecture) 2) Cinematic works (videos, films, installations) 3) Tool in math art (softwares, 3D printers) 4) Education, history and philosophy in and through Math Art. François Apéry (Mulhouse), Luc Bénard (Montréal), Claude Bruter (Paris), Jean Constant (Santa Fe), Michele Emmer (Rome), Michael Field (Houston), Dmitri Kozlov (Moscou), Jos Leys (Anvers), Konrad Polthier (Berlin), John Sullivan (Berlin). 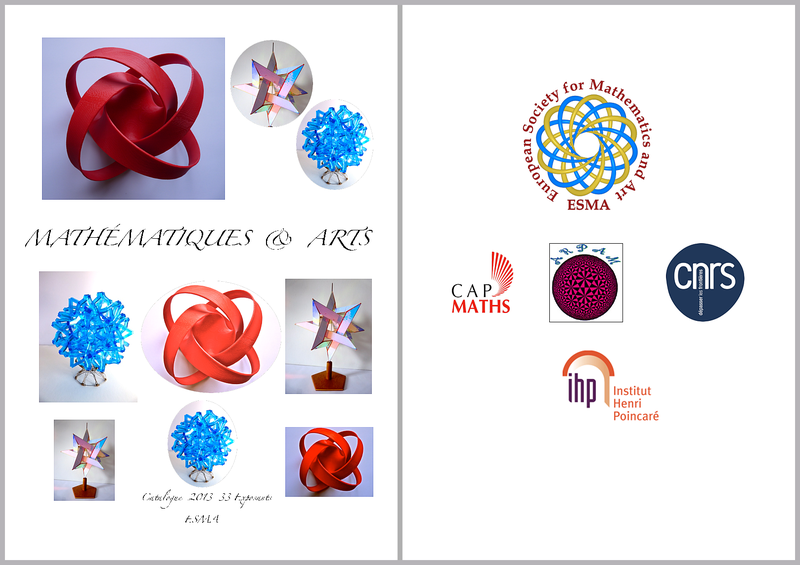 The first Conference of the European Society for Mathematics and the Arts (ESMA) was held at the Henri Poincaré Institute in Paris from 19 July to 22 July 2010, and was accompanied by an exhibition qt the same Institute (see http://mathart.eu/ihp10/index.html). This volume gathers together the texts of the majority of talks held during the conference. 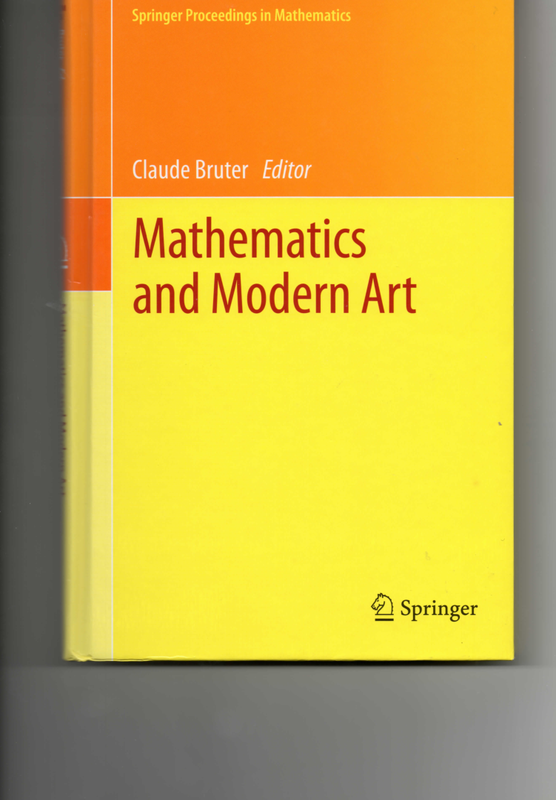 A large proportion of the public may still question whether one can closely link mathematics and art. In fact, that link, implicit or explicit, was established with the first creations of decorative and re- ligious art. Great painters, whose imagination and creativity also had a rational basis, found the structural foundations of their art inside the mathematics to whose development they sometimes contributed. The remarkable course of the symbolic sciences in the last hundred and fifty years and what it has revealed have provided us an inkling of the diversity of forms that can populate spaces, and above all ours. Because it is not bound with numbers, this diversity is infinite. These forms, mostly unexpected and often very beautiful, cannot help but arouse the curiosity of mathematicians and artists alike. By making these forms known through their work – which allows them to reach the peoples of all countries – artists contribute in a subtle way to making everyone familiar with this wonderful and plentiful universe of new objects. As such, they make an essential contribution to breaking down the psychological barriers that still separate mathematics from some sectors of society. each work: some aspects only, as there are so many different possible approaches to the universe of these abstract physics. One can for example gain access to the practice of number theory, analysis, and algebra. 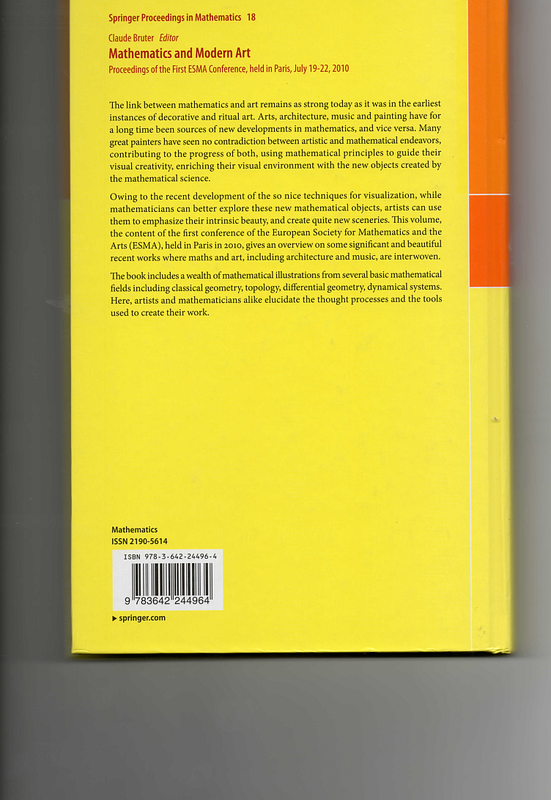 Even if, when reading the book, these main fields of mathematics seem at first blush to be of little benefit to geometry, in truth they have contributed greatly to enhancing the role enjoyed by geometry in its broadest sense, used to describe not only the static and inanimate but also movement and the animate. The emphasis placed on geometry is justified by the fact that it treats both the exterior and the interior forms of objects. Some of these forms are very familiar to us, associated with physical or biological objects created by nature long ago, or even more recently by man himself. One can observe the particularly strong presence of pure mathematical forms in artifacts of the latter type, whether it be the table (square, rectangular, circular, elliptic), the cubic pedestal, parallelepiped furniture, the pyramid on a square base, or the most recent roofing technologies to shelter opera houses. The forms are in a sense the incarnation of geometry in the physical world. Conversely, we could say that geometry is an incarnation of the physical world in the symbolic world. As such, it is fitting that many articles in this work show where these two types of incarnation appear. First readers of this book will no doubt be mathematicians and artists. The former will most likely explore the work out of intellectual and aesthetic interest, and to better imprint their minds with the reality and knowledge of objects that they have already encountered, or even contributed to creating. But the same concern for curiosity and interest will surely motivate many artists. Insofar as the contributing authors reveal their methods and the techniques they advocate, the articles should be capable of giving stimulus to all those who would like to acquaint themselves with these modern forms of art before penetrating further. structed and that we continue to create naturally escape igneous destruction. The replacement of the oil painting and the brush by the computer, of the coloured powder by the number, of the physical motif in our environment by the symbolic motif discovered and simultaneously created by the mathematician, fits suitably into this evolution. This volume provides the evidence for a scientific and artistic movement destined to assimilate such rich developments.